Using your book to introduce yourself is certainly a creative spin on the old business card. 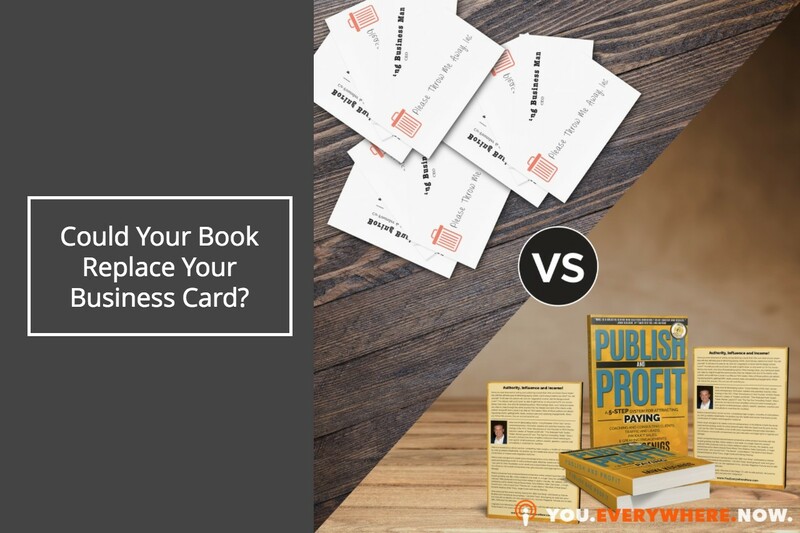 I want to share with you why a book is the best business card to get introduced to virtually anyone. Then I'm going to tell you exactly what you need to write inside of your book to get every one of them to remember you. One of the things I’ve learned is that giving a book to someone is the single most powerful way to get introduced to them, period. One day on a flight to Austin, Texas, I saw a couple of people chatting in the seats ahead. I peered around the seats and, of course, he was sitting there. Richard is one of these guys I've always wanted to meet. He's a fascinating guy. He's got lots of opinions and I grew up back in the day of Jaws, Close Encounters of the Third Kind, and Mr. Holland's Opus. I looked him up on my phone and I realized that he had a nonprofit organization on a topic that I'm really passionate about as well. It turns out I know a few things about raising money for nonprofits because my wife has a nonprofit and I've raised a couple of million dollars for that over the past few years. At that point, I handed him my book in which I had written something special. To make a long story short, he managed to get the stewardess to get us to sit next to each other on our next flight. Two weeks later here he was in my studio and I was interviewing him, which was quite the treat. Yes, that was kind of a happenstance opportunity. We were on the same flight, going to the same place. But, the fact is that since then I've used this exact same strategy many times over to get the attention of people that I wanted to connect with. Whether they're VIPs, CEOs, or celebrities, THIS WORKS. Learn what writing a book can do for your business, your status, and your credibility by getting my free best-selling book Publish & Profit here. What's the secret formula that I wrote in the book? Raise money for your foundation. Get you in the media. Get you in the news. …whatever it is that you can help someone with. Everyone is handing out business cards. Everyone has seen a business card. People throw away business cards. People don't throw away books. Books have a lot of value. Here’s why I think writing a book for your business is so important. First of all, your book equals access, income, and power. It also gives you that additional gravitas, the authority, expert status, and a voice. It's like getting an exclusive VIP ticket to a private, members only club. My story was just one time this worked, but I've met a ton of people this way. It helps you become competition proof and recession proof. It gives you access to CEOs, VIP, the media, and celebrities. It allows you to bypass the formalities and get down into business with what I call a Perfect Package. What do I mean by a Perfect Package? When you have a book cover made and you get to say, “Here's what it is and here's what it's for,” people remember you. In this day and age with social media and texting and every other doodad going on, something physical that has value, is remembered. A book can take on multiple forms. It can be a Kindle book. It can be an audio book. It can also become a roadmap for your entire social media broadcast message that you may have. But, it definitely is something that I take with me everywhere I go. I've always got 3-4 copies of my book and a handy-dandy Sharpie pen everywhere I go, ready to introduce myself to anyone that I want to connect with. If you want to learn how writing a book can help you and your business, click the button below to take my author quiz.